What are you doing? Watch this right now! OH HELL YEAH! 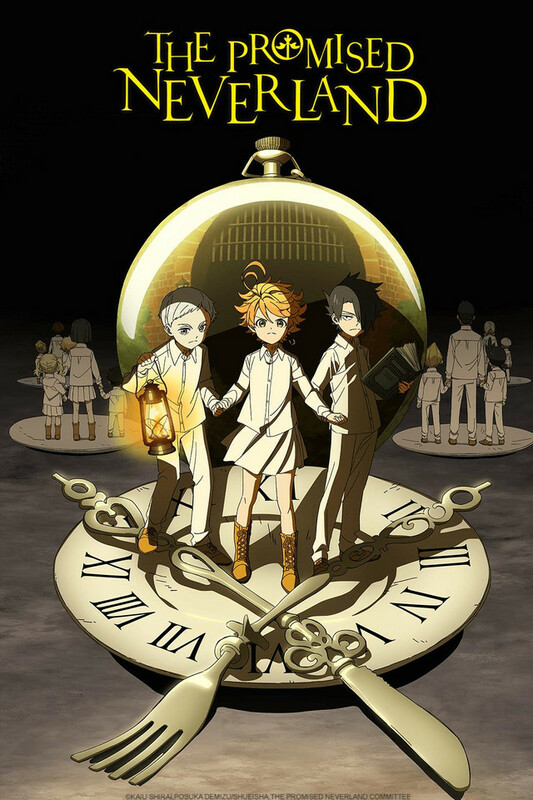 The Promised Neverland has finally become an anime and oh BOY does it exceed expectations. This masterpiece is part of Shounen Jump's lineup and is about a tactics-based story with lots of lies and deceit... I recommend to jump right on in as it's enjoyed best the less you know about various plot twists and surprises! As for the anime itself, honestly so far I'm enjoying it more than the manga, which is something I never thought was even possible. The animation is top-notch quality with seamless use of 3d and 2d, very smooth and deliberate direction and loveable character designs. The music is gorgeous and in particular, memorable- the show does a wonderful job of integrating music with the tone of a particular scene. The characters are fantastic- the story primarily focuses on the main trio and how their relationships and character arcs develop throughout the story. This anime has done a fantastic job of delivering the plot so far without revealing mysteries or being too obvious with particular sequences. It's just brilliant. This is a hidden gem in the season of Winter 2019 and I highly recommend you check it out! Having read the manga I came into this show it’s some pretty high expectations. And I have to say so far they have been met. The animation is fluid and the facial expressions really convey their emotions. In the beginning scene of the first episode I was really impressed with the amount of characters moving on the screen and how lively they looked. On the the direction so far I have to say that they are really doing a good job. The scenes that are supposed to be tense are tense, and the ones that are supposed to be light hearted are such. The Composition and camera angles are really done well too. So yea, so far the series is living up to the hype, well for me at least. I’m excited to continue this series. Disclaimer: This is just a review of the first episode. If by the end of the season, I think that it'll need an updated score, then I'll change the rating to one that I see suitable once this season ends. The first episode was amazing! Stunning animation and story accompanied by arguably one of the best openings of the season. I can't wait for more! I have been following the manga way before the anime was announced, and cannot be happier with this first episode. If you like dark stories, look no further. The animation fits perfectly, and the OST is wonderful. P.S. Ignore the children leaving 1-star reviews because of region what-not. Report them as spam. Edgy and dark anime ahead! Be aware this anime appears cute and innocent but is actually dark and edgy about half way in! It leaves one with so many questions! Like Hiw did this become the current reality for these orphans and what in the world is going to happen in episode 2! Just be prepared for a dark revelation mid episode that may crush your mortal heart! This is excellent art work!